I have a lousy memory for things I donâ€™t find interesting (like timelines and to-do lists), so Iâ€™ve historically been notoriously disorganized. In my research days, absent minded professors were par for the course, and I could rely on the notes in my lab notebook to keep me on track. When I changed careers to development, my disorganization became more acute. There are no markers in well written code, and planning meetings and such demanded more control over what I was doing with my time. Throw in the unexpected application fault or server failure, and any level of planning goes out the window. As my responsibilities grew in the corporate world, I knew I had to improve. Any system I put in place had to be something easy for me to carry around, be a unified place to look for what Iâ€™m supposed to be doing, and have a workflow that could be interrupted and restarted easily. Having a job my current one (Technical Evangelist for ComponentOne) means an insane schedule of talk submissions, travel, coordinating support for community events, and trips to Starbucks. When I walked into this job, I was very glad I had put in place some discipline at my last one. Hereâ€™s what Iâ€™ve found most helpful. Originally designed by Merlin Mann (http://www.43folders.com/), this is my favorite GTD-like process. If youâ€™re not familiar, take 12 folders (I prefer manila pocket folders, supported by hanging folders) and name them for the months, and 31 folders, numbered for the days. If youâ€™re starting on Jan 1, youâ€™d have January be the front folder, followed by the days, then followed by the rest of the months. Take out January, see if anything with a date, put it in the correct dayâ€™s folder. Move January to the back. Take out the folder for the 1st, and work on the stuff in the folder. At the end of the day, make sure the 1st is empty; if anything didnâ€™t get completed, put it in the folder for the 2nd. Move the folder for the 1st behind February. Today is Sept 15, so September is the very last folder in my drawer. Days 1-14 are lined up behind October, and Iâ€™m working out of the 15th. Itineraries for my travel at the end of the month are in the folders for those days. When I go home, Iâ€™ll take the 16th with me in case I have some time in the evening to review and maybe complete something small. David Seah (http://davidseah.com/productivity-tools/) has some awesome productivity tools; the one I use the most is the Emergent Task Planner. I plan a couple things every day, and I can keep track of all the little BS that pops up through the day. At my previous job, I had a chatty coworker, and Iâ€™d mark off his interruptions. I started allocating him a certain amount of time each day, and would cut him off when he reached his limit (this is legendary at my old officeâ€”I even bought an egg timer so he knew how much time was left). It was all done in good humor, and we had a good relationship, which is why I allocated any time at all, but when I showed him how much time we lost chatting, even he was amazed. Anyhow, I start a new one each day Iâ€™m at the officeâ€”I donâ€™t use them when Iâ€™m travelling or speakingâ€”and they make a great reference in case I need to prove a point about meetings or my productivity. Itâ€™s important to be honest, Starbucks trips do go on the form. The originator of the whole â€œgetting things doneâ€ movement is David Allen, whose book Getting Things Done lends its name to the movement. Iâ€™m still working on implementing the advice in this bookâ€”I still struggle with my inbox. It consistently hovers around 100 emails. Some people (like Brent Ozar) are stellar at â€œinbox zeroâ€, but I have trouble finding a way to organize things in motion, and there is a lot in motion in my life. I could probably print out the emails and put them in my 43 folders, but I refuse to waste the paper. Categories and follow-up flags in Outlook arenâ€™t very flexible, and donâ€™t translate to my iPad or my phone. And, I refuse to have a second set of electronic foldersâ€”too many places to look. So Iâ€™m working on this. Iâ€™d like to spend more time checking out Personal Kanban (http://www.personalkanban.com/pk/). The kanban boards used in Scrum are great, and Iâ€™ve been pondering how to adapt one in my personal life for a while. Despite several startsâ€”both process and applicationâ€”I havenâ€™t quite developed a system I like. But just like GTD, Iâ€™m refining as I go. Iâ€™ll post some more when I have enough of a system to discuss. Like every developer I know, I have about 20 side projects cycling through my head and in various states of development. At my previous job, we implemented Axosoftâ€™s OnTime (http://www.axosoft.com/) with decent success. Axosoft now has a hosted version free for two users. It is awesomeâ€”there is a mobile web app so I can update features/projects as I think of them, and a great full featured web interface. Systems like this are the future of ALM. For source code, I currently use Beanstalk (http://beanstalkapp.com/), but GitHub has me curious. Beanstalk supports both Subversion and Git. I also use FTP VC (http://www.prestosoft.com/fvc_ftpvc.asp), which I connect to my shared hosting account. The title of this post is my current tagline on LinkedIn, and it’s a slightly cheeky summary of who I am. On Twitter today, I was asked how I became a Technical Evangelist if I’m a biologist. I’m posting this story here because it’s more of a personal journey than a ComponentOne story. I mention I’m a biologist in my Twitter profile because my friend Andy Carvin was live tweeting coverage of Osama bin Ladin’s death, which raised a lot of questions about how the DNA results could be conclusive. I tweeted back some clarifying answers, which he retweeted, which prompted a deluge of “what does a technical evangelist know about DNA?” I updated my profile to answer the questions, and completely forgot about it. I tell this story a lot, although not always in its entirety, so for Uma, here it is. Upon review, I realize that (good lord) I’m a nerd. Below are the highlights of the transition. I’ve always loved science. By second grade I had a chemistry set and a microscope and I knew how to use both. My favorite Christmas present growing up was a very high quality butterfly net and Riker mounts–entomology was a hobby I picked up at Zoo Camp in Santa Barbara. In high school, I was on the science team and computer team (we programmed in MS BASIC back then). At Allegheny College, I had to choose a major, which was a tough decision. I settled on Aquatic Environments, because that got me close to bodies of water, which meant I could go fishing. This major and a few others were generalized into Environmental Science, and that’s my official Bachelor’s degree. At Allegheny, we are required to do a senior thesis, called a “Comp”. Most of the scientists I cited in my comp were at the University of Alabama, so that is where I went to graduate school. My first semester, I met Perry Churchill, who was doing some work in bacterial bioremediation. Our personalities, and my environmental background and interest in wet biology made us a great team, and I worked for Perry for two years, eventually earning my M.S. We started looking at the genetics of these bacteria as a side project, which how I learned to manipulate DNA and purify proteins. After graduation, I applied for a number of jobs, and the first one I got was at UAB as a molecular biologist. I worked for several years in the Neurobiology Research Center, using advanced molecular and electrophysiological techniques to study GABA receptors. GABA receptors are found in the brain, play a role in epilepsy, and are affected by alcohol and anesthetics. They’re basically the off switches for your brain–when you’re “put under” for surgery, the anesthesia affects these receptors, knocking you out (you’re not asleep, just in a state of very low awareness–sleep is controlled by a different set of molecules and neuroreceptors). While at UAB, I re-met my wife, and later moved to Pittsburgh with her, working for a time at Pitt, studying cystic fibrosis. Along the way, I published a number of scholarly papers, and I can tell you exactly why the default CSS styles are the way they are. It’s a little known fact I do not own any video game console, and haven’t played video games since the Atari 2600 in the mid-1980s. But I do have a great telescope and I love to stargaze with my daughter. At two-and-a-half, she would see the moon on a clear night, and ask to take the telescope out. She could find Jupiter in the sky when it was visible before her bedtime. My wife is key to the story, and I want to add how we met because it’s a funny coincidence. While at Allegheny, I briefly dated a girl who lived across the hall from my now wife. Tradition at Allegheny is that when a girl pledges a sorority, the sisters decorate the door of the pledge with the sorority colors and emblems. Because I’m tall, I helped decorate my now wife’s door when she pledged. She and I had a number of friends in common, but didn’t give each other much thought at the time. During my time at UAB, my brother moved to Birmingham and was my roommate for several years. I became friendly with a bank teller, we had lunch, got to talking, she had a single sister, I had a single brother, so we wet up a double date. My brother and the teller’s sister have been married for 12 years now. When my brother looked at business schools, he liked what Bama had to offer, and it was close to his then-girlfriend-now-wife. During his admissions interview, he saw an Allegheny College diploma on the wall, got to talking, and connected names (my wife has her MBA from Bama, and was working on admissions strategy–she did the interview because no one else was around that day). I got back in touch with his interviewer, whose door I had helped decorate a few years prior, and the rest (as they say) is history. She and I have been married for almost 12 years now (my brother and I were married within 6 weeks of each other). On our first date, my wife asked me what I would be doing if I wasn’t a scientist. I told her I thought being a florist would be cool, because flowers are so diverse and beautiful, and they have the power to totally transform how people feel. As it turned out, her parents owned greenhouses and a small florist shop. In 1998, when an established shop became available in her hometown outside of Pittsburgh, we cashed in our 401Ks and bought it (if you’re counting, we bought the shop together before we were married). This is what prompted the move from UAB to Pitt. I do not have a creative bone in my body, so I worked in research to make ends meet, and she ran the shop. We were one of the first florists to have a website, and a number of trade magazines interviewed us for articles over the next few years. In 2004, we did something crazy–we opened a second website, specializing in wedding designs and accessories. I added a new technology called a blog to that site, and wrote weekly about the weddings we had done. In just a couple years, we built our wedding and event business from a handful each year to well over 100 weddings and events each season. For a number of years, we were the only florists in the industry to have two e-commerce websites, not to mention a blog. People either didn’t understand what we were doing, or thought we were crazy. 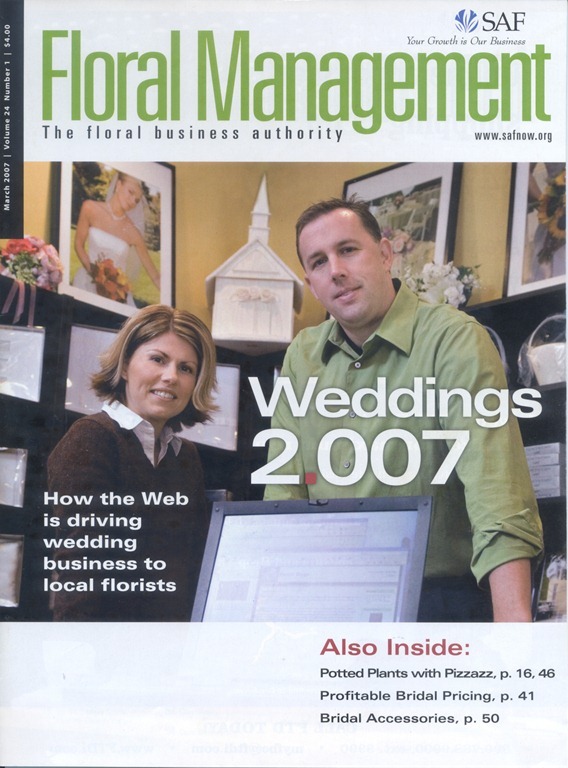 In 2005, I spoke to a crowd of several hundred florists at the Society of American Florists (SAF) about blogging, and in 2007 SAF put us on the cover of their Floral Management magazine, in an article about how we attracted brides using the Internet. Even today, there are a number of brides each summer we never meet–all the planning is carried out through email. 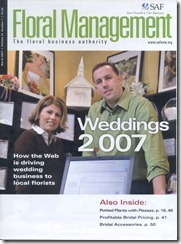 Also in 2005, I started Florist Blogs to help florists get online with a blog. A number of prominent florists blog there, and the site generates about a million page views each year. I’m updating the software from the now way out of date Community Server 2.1 to WordPress, which should breathe some new life into the site. In 2010, to simplify life a great deal, we closed the retail shop, and my wife scaled back the number of weddings she handles each year, working out of studio space. The only web presence we currently have is a WordPress blog, at http://bloomeryweddings.com/. Rewind a couple years, back to 2000. The dot com bubble is at a peak, and I wrote an e-commerce website. Not many people could say that at that time. My commute to Pitt was over an hour, and was grinding me down. A company five minutes from my house was advertising for an e-commerce developer, a job which paid more than I was making in research. I applied and got the job. On a Friday in December 2010, I cleaned out my lab bench for the last time. The following Monday, I walked into an IT job for the first time. I loved the company and my job–I maintained several e-commerce websites for our toys division, implemented a new EDI system when the company implemented a new ERP system, and learned networking and PC repair. Sadly, about 11 months after I started, the world would change forever with the September 11 attacks. In a farm field about an hour from where I was at work that day, the first “line in the sand” was drawn in the fight against the terrorists, which emotionally affected this region a great deal. I mention this event to bring the story full circle with why I mentioned I’m a biologist in my Twitter profile. The combination of business cycles and terrorism crushed the economy, and I was laid off in 2003. I started consulting, and eventually ended up on a three month contract at logistics company in Pittsburgh. I ended up working there for seven years, becoming the senior developer responsible for our line of business applications and systems integrations. In 2010, we were ranked #32 in Information Week’s “250 Most Innovative Companies”, so I got to do a lot of cool stuff. 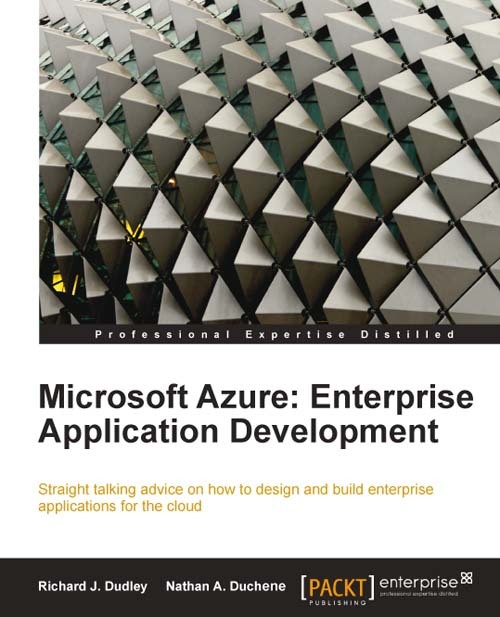 My team looked at Azure as a possible solution for some external applications, and like a lot of companies, it was wait-and-see. 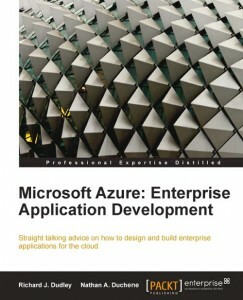 But, from that experience, my coworker Nathan Duchene and I wrote Microsoft Azure: Enterprise Application Development for Packt Publishing (I had pitched a completely different idea initially, but when they checked out my blog they asked I write an Azure book). It’s a cool feeling–we have two 5 star reviews on Amazon, and the Kindle version just became available. Because I’m self taught, I made it a point to attend every event Microsoft held in Pittsburgh (dragging my team with me), and as many user groups meetings as I could make. I remember watching the MS evangelists (notably Ken Lefebvre, Stan Spotts, Geoff Snowman, Andrew Duthie, Lindsay Rutter, Dani Diaz and Dave Isbitski), thinking that would be the coolest job ever. Last spring, ComponentOne was advertising for an evangelist. I was familiar with their products, having evaluated them at the logistics company, and I had a great deal of relevant experience. I looked again at their components, loved what I saw since my last look, and applied for the job. I started with ComponentOne in August of 2010. So, long story short, I became a technical evangelist from a biologist because we bought a flower shop. The obvious and direct career path, right? When you see my ComponentOne bio or Twitter profile (which I’m going to leave as-is for a while), you now know the highlights. Thanks for reading my story! I found out today one of my fraternity brothers was killed in Mexico over the weekend. Brad and I had rooms next to each other as freshmen, and we could talk through the hole in the wall for the radiator pipe at night (which annoyed his roommate to no end). He had the greatest collection of Doors albums, and we spent hours jamming. Later, we pledged the same fraternity, and lived in the house for the next couple of years. Brad eventually went his own way, leaving the fraternity and Allegheny College. We lost touch after that. He went goodness knows where, and I went to Alabama for graduate school. Brad’s easygoing nature often belied just how smart he was. He was one of those guys who could instantly find a hole in any argument, but wouldn’t argue the point. Brad was a good talker, and relished good, thoughtful conversation. Instead of being an arguer, he’d lay out what he was thinking and why. Sometimes, he and I saw eye to eye on issues, and sometimes we were polar opposites. No matter, he was respectful of you, even when you disagreed. It wasn’t much of a surprise to find out he was a videographer for Indymedia. That just suited him perfectly. The photo below is part of the story of his death at http://www.indymedia.org/en/2006/10/849305.shtml, and is a great image of Brad. This was his thoughtful conversation look, and is a good way to remember him. If you never knew him, this photo’s all the introduction you need. There’s some more story at http://www.forbes.com/technology/ebusiness/feeds/ap/2006/10/29/ap3128352.html. CleanTown USA is Pittsburgh’s favorite car wash. It’s an amazing 16,000 sq ft facility, with two giant conveyor belts that move your car as a team cleans the interior. The first website was a highly stylized design that provided a retro-futuristic feel, but took forever to load, and the navigation was not very user friendly. It was also a pain to update, since every page was created by slicing apart Photoshop files and touching up the HTML in Dreamweaver. To provide greater functionality, better navigation and quicker load times, we decided to use DotNetNuke as the basis for the new website. The included calendar, photo gallery and blog functionality are nice additions to the site. Gift card sales are enabled by CATALooK .netStore Pro, and custom information forms are handled by XMod. We compromised on the design to provide layout flexibility, and the default blue skin fit the company perfectly. You can see the upgraded site at www.CleanTownUSA.com. We have GolfGladiators.com up and running. Based on Community Server 2.1, this is the 45–minute installation I did from the airport (see http://www.rjdudley.com/blog/How+Fast+Can+You+Set+Up+A+Community+Server+Site.aspx). We have some forums still to set up, but the Ryder Cup forum is online, and so is one devoted to Tiger Woods. We’ll eventually have forums for course reviews in all 50 states. If you’re in, say, Wisconsin, and want one before I work my way down the alphabet, let me know. My mad art skillz are evident on the logo. Also, we’re working on some interactive challenges and distance games you can play. Stay tuned for those. In the meantime, if you enjoy golf, join us at www.GolfGladiators.com. This was followed with some discussion in the next day’s post (http://www.led-digest.com/content/view/406/55/).